In my world, we make things out of wood. 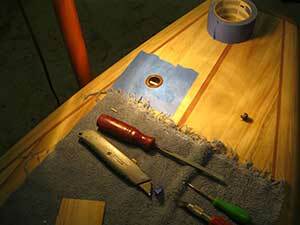 But it wasn’t clear at first just how involved our relationship with hollow wood paddleboards would become. Surfboards, paddleboards, and sup paddles have become an obsession. I have always involved myself fully when I commit to doing anything worth doing and building these boards and paddles is no exception. True, I want to make this my business. It’s a hell of a lot more fun than building cabinets. But it’s as much about sharing the stoke and building an artful object that you can go out and play with as much as it’s about selling paddleboard kits and paddles. The boards and paddles come alive when they hit the water. “They” are in “their” element when they hit the water and I am right there to help in the effort! What do I get out of all this? It’s about sharing with others the idea that any of us can create a hollow wood paddle board or surf board if we commit to the process, show patience in our approach to the work and perservere in our efforts to bring life to humble bits of wood.